Hello Urbana! This post is part of a series about the artwork selected for the Murals on Glass project. Murals on Glass is a public art project that displays local artists’ work on windows throughout downtown Urbana. Each artwork chosen is reproduced by the city of Urbana in adhesive vinyl and adhered to these windows. The project aims to integrate art into our urban environment, beautify and improve our city streetscape, and enrich the lives of Urbana residents and visitors. There are three locations where you can see these works: The Urbana Business Association office windows on Main Street, and on the northeast and south windows of the Parking Deck between Main Street, Broadway Avenue, and Elm Street. These pieces are going up in August and will stay there for an entire year, so you will have plenty of time to admire them! Today’s post features local artist Kelly Eddington. Her piece, Glass Gems, will be on display in the window of the Urbana Business Association. Keep reading to see what Kelly has to say about her work. What media is Glass Gems? Kelly: One of my favorite things to do as a painter is to create surfaces that look shiny or wet. It’s not that hard, but viewers seem to thing that something magical is going on. I bought a small bag of multicolored glass at a dollar store in Champaign in December. These are often used in aquariums and floral arrangements. I stacked them into a little pile next to my studio window and hit them with a couple of lamps. I was amazed at the layered, glowing reflections I saw. Along with the reflections of the lamps, my hands, and a naked apple tree outside my window, some of the gems seemed to contain strange creatures–my husband Jeff described them as alien eggs. How will the viewers respond to seeing the piece on such a large scale? Kelly: The original painting is 21″x29″, which I thought was already pretty big. I blew up each glass gem–normally no larger than a quarter–to dinner plate size. This allowed me to pack each gem with details and pumped-up colors. Each gem took an entire day to paint. It’s the kind of painting that looks good from a distance, but when you see it from a few inches away, you can appreciate all the tiny details and color changes that were so time-consuming. I hope that when the painting is blown up to mural-size, viewers will become immersed in a world of thousands of colors. I’m glad that it will be displayed at street level, where viewers can see my details up close. I’ve often joked that this painting looks like it would taste incredible if licked, like some kind of Willy Wonka fantasy candy, but I hope people won’t be tempted to do that to the windows of the Urbana Business Association. Kelly is excited and honored to have her work chosen for Murals on Glass, and she hopes that people visiting downtown Urbana will enjoy seeing it. 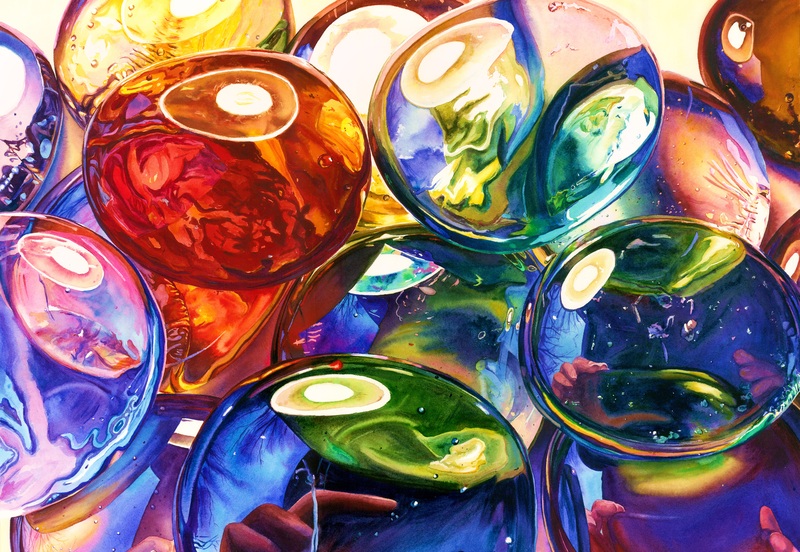 This entry was posted in Uncategorized and tagged arts, glass, kelly eddington, murals, public, urbana, watercolor. Bookmark the permalink.